An early proponent of cryptocurrency and one of the most well-known Bitcoin bulls, Mike Novogratz continues to tout the value of cryptocurrency and push institutional investors towards a new era of finance. 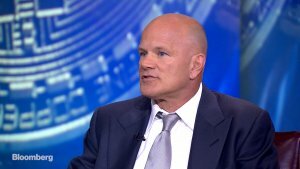 A former portfolio manager for Fortress Investment Group and Partner at Goldman Sachs, Mike Novogratz has uniquely poised himself as an early cryptocurrency bull with an institutional investment background – bridging the gap between shifting sentiment regarding cryptocurrency investing today. The arising integration of blockchain technology in industries across the board and around the world has set the stage for a future truly revolutionized by decentralized services and products. Most recently, Galaxy Digital and Bloomberg officially launched the Bloomberg Galaxy Crypto Index (BGCI), an index of the top 10 global cryptocurrencies weighted by market capitalization. The BGCI partnership indicates radical shifts in institutional investor sentiment regarding cryptocurrency, as the market demands a better benchmark for an overview of value. According to CNN, Novogratz has even predicted that the New York Stock Exchange will implement cryptocurrency trading desks within the next six months. This prediction falls in line with recent announcements that Goldman Sachs will be opening a bitcoin futures trading desk. To view the full interview with Mike Novogratz, please see this link (CNN).